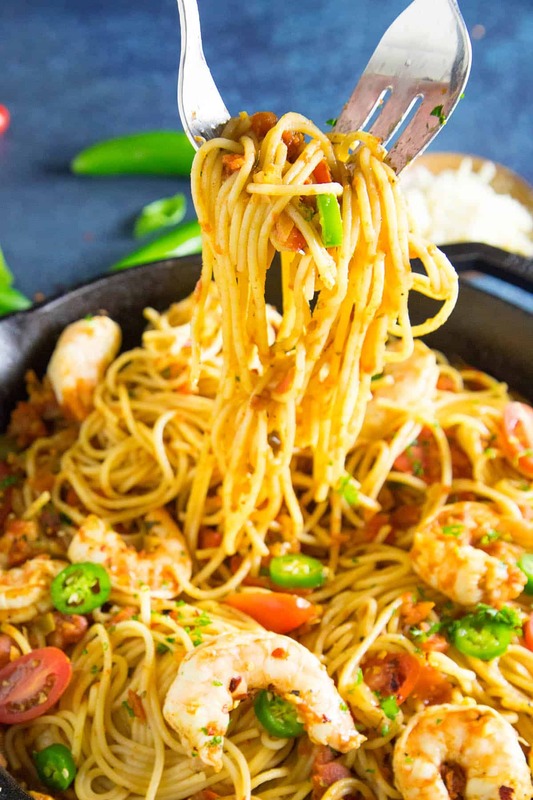 This shrimp pasta is loaded with a blend of Cajun seasonings, succulent shrimp, spaghetti noodles and a spicy red tomato sauce with just a touch of optional ghost powder for those who love it EXTRA spicy. Here is the recipe. I think of all the seasoning blends in the world, a good Cajun blend is one of my very favorites. I typically use my own Homemade Cajun Seasoning recipe, but there are some very good ones on the market today. Just search your local grocer. 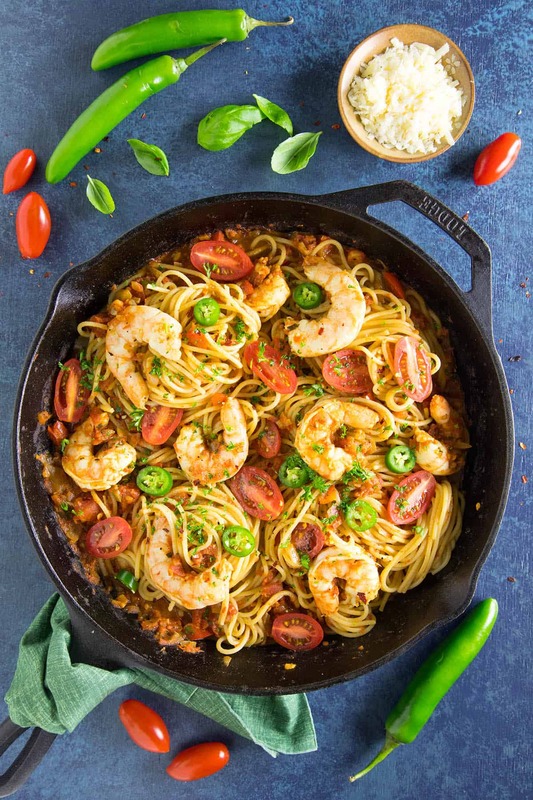 Cajun seasonings can vary, but most contain the perfect blend of hot, spicy, and flavorful elements. As most Cajun food and seasonings are very “spicy” but not very “hot”, I’ve brought in a bit of ghost pepper chili powder to add an element of that heat I so desperately crave. I’m sure many of you do, too! We can’t help ourselves! We’re chiliheads! 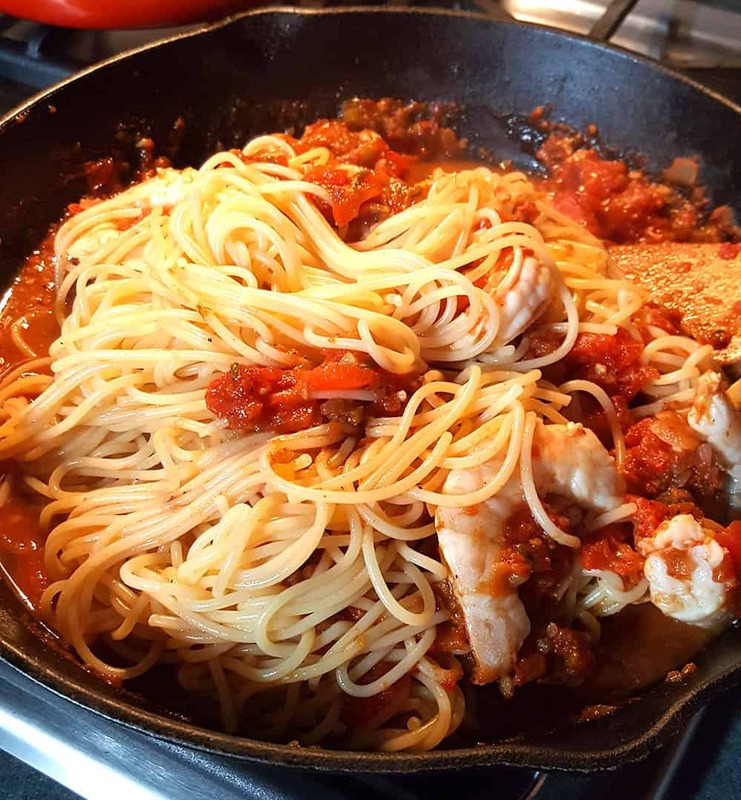 First, gather up all of your ingredients and heat a large pan to medium heat. Drizzle in some olive oil. Add in some onion, celery and peppers and cook them down until they begin to soften up, about 5 minutes or so. Stir in the garlic and cook for another minute. You will be able to smell that awesome garlic cooking. SO. GOOD. Pour in the tomatoes, basil and seasonings and bring the mix to a quick boil. Reduce the heat and let the sauce simmer about 20 minutes (or longer) to let the flavors develop. Mine is nice and thick here. You can easily add in more tomato sauce if you’re looking for a thinner, saucier version. I like mine nice and chunky. While the sauce is simmering, bring a pot of salted water to a boil and cook your noodles to the packaging instructions, about 10 minutes or so to al dente. However you like it! Tuck the shrimp into the simmering pasta sauce and let them cook through, about 5 minutes. Drain your pasta but reserve about a half cup of the starchy pasta water. Swirl the reserved pasta water into your sauce. The starches from the pasta water actually help to bind and thicken up the sauce a bit more. Toss the noodles with the sauce and shrimp. Serve it all up into bowls and top with Parmesan cheese, fresh chopped parsley, sliced peppers, and sliced cherry tomatoes. Oh baby! This is SO GOOD! I used both jalapeno peppers and serrano peppers in lieu of the traditional green bell peppers in Cajun cooking because I wanted more heat to the final dish. Bell peppers have no heat to them at all. Jalapenos are the most commonly used in the U.S., and run about 5,000 Scoville Heat Units (SHU) on average. Serrano peppers measure in around 50,000 Scoville Heat Units, so they DO have some good heat. Feel free to stop there in terms of peppers and seasonings. I also added in a BIT of ghost pepper chili powder. Ghost peppers add some serious heat, measuring in at around 1 Million Scoville Heat Units. Of course you can omit the ghost pepper powder for a milder, yet still spicy with good heat, version of the recipe. You just gotta ask yourself – How spicy do I like it? A good Cajun sausage would be a nice addition to this recipe. Consider smoked andouille sausage, or boudin. It will make the dish heartier and more filling. Can You Use Cooked Shrimp? 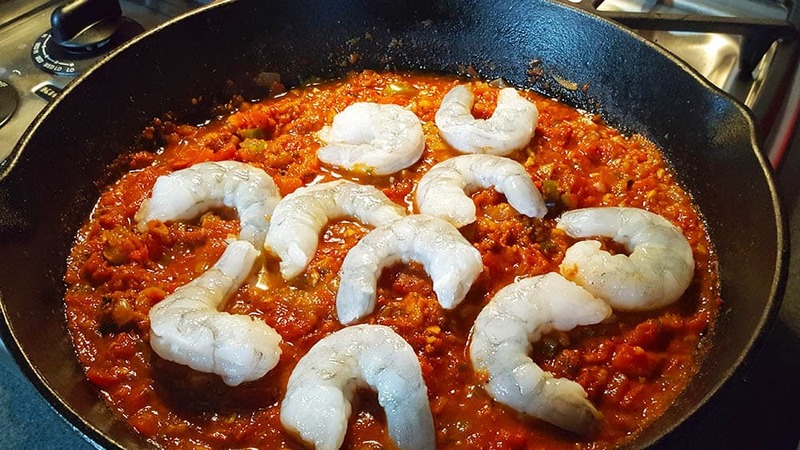 Yes, if you’d like to use cooked shrimp instead of raw shrimp, be sure to thaw them out first, then tuck them into the simmering sauce a few minutes to warm them. 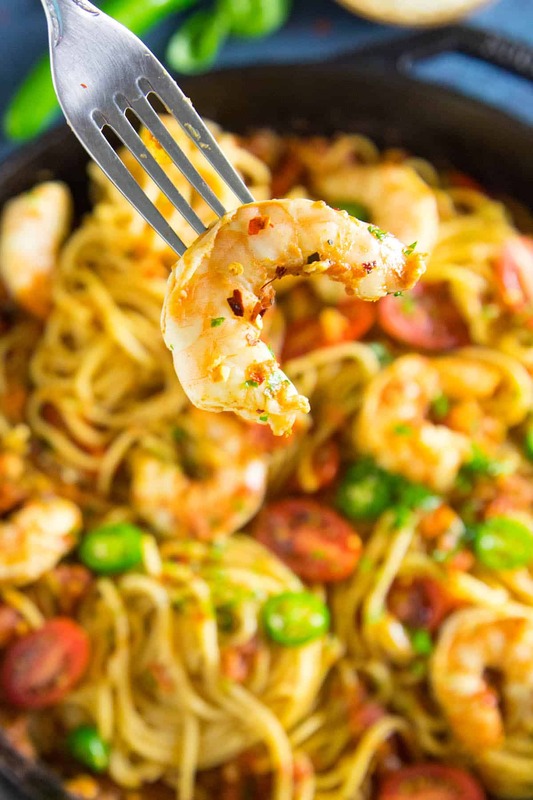 If you like this dish, try these variation – Creamy Cajun Chicken Pasta or Cajun Pasta with Shrimp and Smoked Sausage. Spicy and delicious! 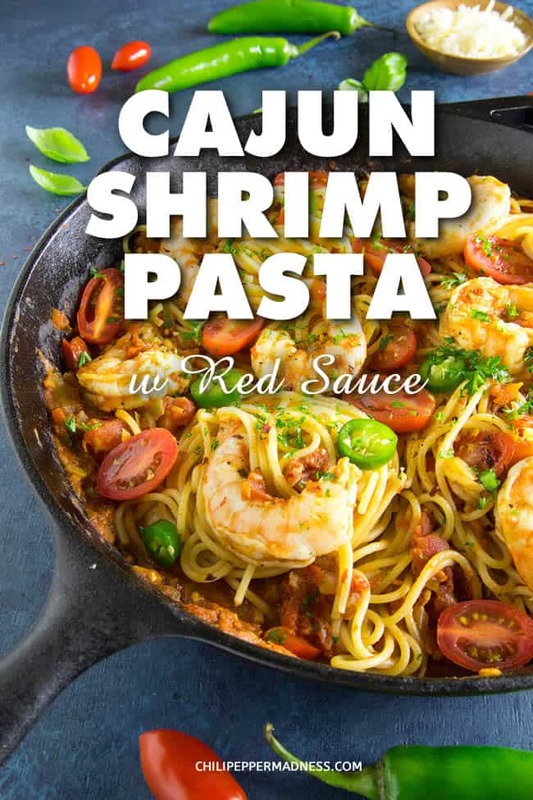 I absolutely love that Mike adds Cajun seasoning to so many meals. 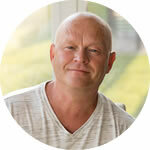 I’ve grown so accustomed to Mike’s cooking that I expect bold flavors with nearly every meal. We’ve gotten much pickier about where we go out to eat because we crave bold flavors and heat so much. Since Mike started blending his own Cajun seasoning he keeps a pretty large amount of it handy at all times. I remember packing for a long trip where he would be doing a lot of cooking and he had run out of the seasoning and was trying to figure out what to do. I said, just make some more. And he did and it took no time to do it. 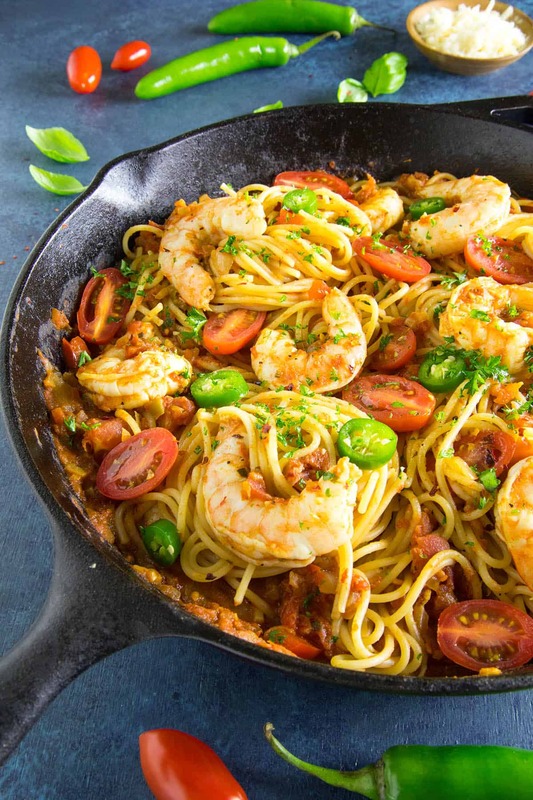 This Cajun Shrimp Pasta dish sure did not disappoint in the flavor or heat department. 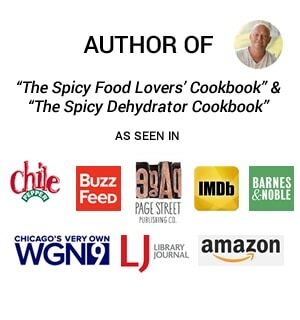 ½ teaspoon ghost pepper seasonings or more if you desire! Optional. Heat a large pot to medium heat and add the olive oil. Add the onion, celery and peppers and cook them down about 5 minutes. Add the tomatoes, basil and seasonings and bring to a quick boil. 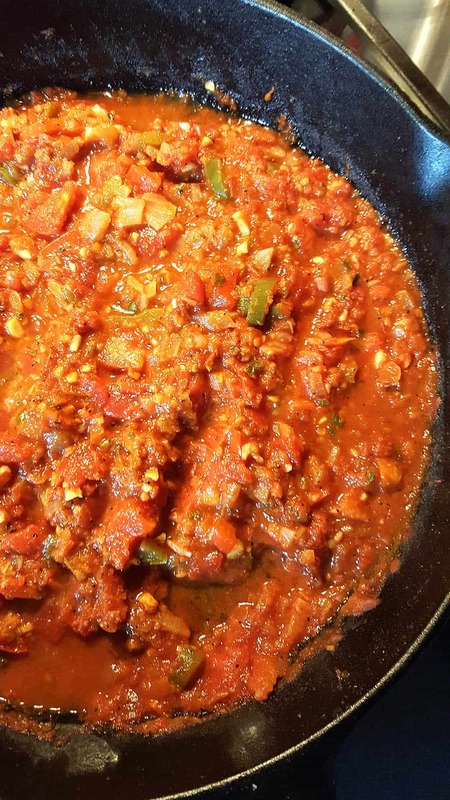 Reduce the heat and let the sauce simmer about 20 minutes (or longer) to let the flavors develop. While the sauce is simmering, bring a pot of salted water to a boil and cook your noodles to the packaging instructions, about 10 minutes or so to al dente. Drain your pasta but reserve about a half cup of the starchy pasta water. Swirl the reserved pasta water into your sauce. Serve into bowls and top with Parmesan cheese, fresh chopped parsley, sliced peppers, and sliced cherry tomatoes. 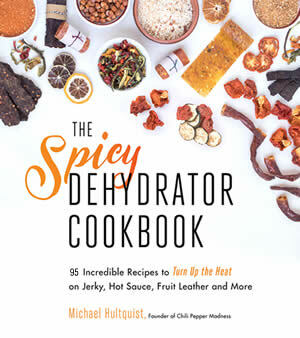 Heat Factor: HOT, though you can easily adjust your heat levels by omitting the ghost pepper powder. quick fix, easy to adjust heat, tastes great. Will be an affordable meal that tastes great for neighborhood get together… and unlike low country boil, doesn’t take hours to prepare… Thanks! p.s. 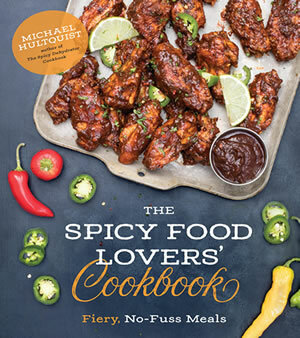 goes great with marie sharpe’s habanero sauce as a topping. ???? Thanks, John! Glad you liked it!